Magnetic Mic™ enhances safety by reducing distracted driving. This easy-to-use conversion kit helps drivers stay focused on the road when picking up and returning a CB or police radio microphone to its holder. Magnetic Mic™ works with virtually all radio systems. 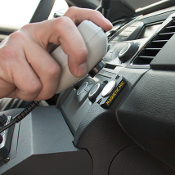 It doesn’t matter if your radio system functions with an on-hook/ off-hook setting, switches to a private line or scans when hung up—it’s ready for use with your radio system. Also great to use with your PA microphone.